Discussion in 'HYIP Discussion' started by All-HYIPs.info, Aug 24, 2018. We welcome everyone at Perfect-Suv.LTD. Our company is fully registered in Australia with registration Number 627894508. For more than 10 years perfect-suv.co has been one of the key suppliers of SUV vehicles throughout Australia. More than a thousand cars were purchased and sold for this period of time, which allows us to create an optimal marketing models for implementation and provide our investors with more than a million dollars profit. 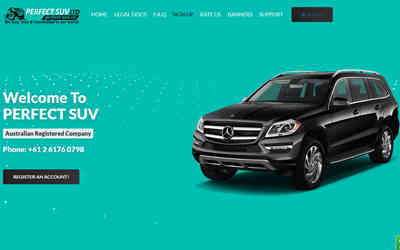 Today we want to invite you to join this business, Becoming our partner our proposal can be described in three points which are: you invest in the next purchase of car suv for sale, We purchase and sell cars alot, The received income replenishes your investment and allows us all to earn money. Ofcourse, as in any business, there can be risk majors, but our many years of experience, diversification of investments in different trading floors and different lots of cars will allow you to maximally secure your contribution. Hundreds of investors have already been able to earn with us and that is why now we are making an opportunity to invest in our business to the public. We can also guarantee the profitability and success of transactions through the pre-order auto system available to our customers in Australia and in other parts of the world. This system indicates the most anticipated models of SUV cars on the market and allows us to ensure that the purchased lot will be sold out as quickly as possible. Today this niche is where demand is consistently higher than supply. The remoteness of the continent from the main production capacities of the largest automakers makes the acquisition of a quality car quite a challenge for an ordinary Australian. After all, in Australia there are no factories Mercedes, Lexus, Toyota, Honda or Renault. In addition, Australia is a continent-country. So most Australians have a regular need to go on a visit to relatives on the other side of the continent. Thus SUV is an ideal choice, because this type of car is equally presentable and functional both in the city and in long journeys, and rather high by the world standards of salaries of Australians allow us to make rather big difference between selling and purchase price. This allows us to pay such good interest to our investors. Nevertheless, the market, although large, but limited, so that oversaturation of its cars can lead to a decline in business profitability. As a result, our investment offer is limited in terms of the number of investors, so hurry up to make it. We welcome all new participants to this wonderful earning opportunity.